The sommelier chemist recommended a reading to be paired with a bottle of 2015 Shaw and Smith Shiraz. Don't let a lack of wine prevent you from reading the paper though! Our collaborative paper on "Control of structure topology and spatial distribution of biomacromolecules in protein@ZIF-8 biocomposites" was accepted in Materials Chemistry. Well done everyone! Weibin is over the moon! We once again celebrated our end of year Xmas party at Richard Keene's place. Fantastic food and a relaxing time for all. Former PhD student in the group Jack Evans got married in Paris last weekend. Congratulations Jack and Carla! 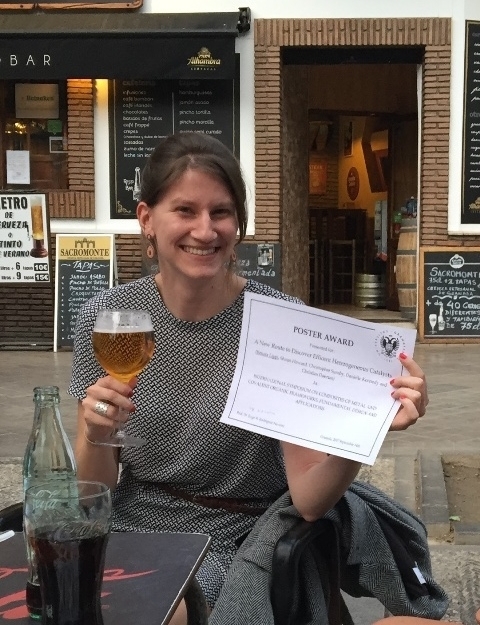 Renata Lippi has won a poster prize for her poster "A New Route to Discover Efficient Heterogenous Catalysts" at the International Symposium On Composites of Metal and Covalent Organic Frameworks: Fundamental Design & Applications. Well done Renata! You can read some of Renata's recent work here.